This sky map shows how the planet Mars and the moon will appear together at midnight local time between Dec. 16 and 17, 2011. If you're out during the very late evening hours tonight (Dec. 16), check out the eastern sky just before midnight. There you'll see a waning gibbous moon less than a day before it arrives at last quarter (half) phase. Hovering well off to its left and at a slightly higher altitude above the horizon is a rather conspicuous "star," shining with a fiery tint, which is the planet Mars. 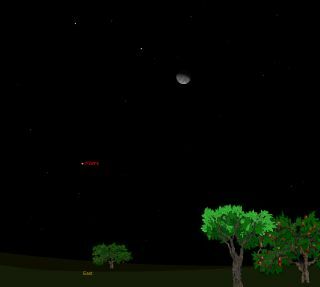 The apparent distance between the sky map of Mars and the moon here shows how they appear together in the night sky. But between now and then Mars is going to become far more prominent in our sky. Between tonight and its next encounter with the moon in mid-January, Mars will appear to travel part of the distance from the star Regulus in the constellation Leo to Spica in Virgo; it will pass from Leo into Virgo in mid-January. Currently, Mars rises around 11 p.m. local time. But by Jan. 13, it will be coming up before 9:45 p.m. The planet is highest in the south at dawn's first light: an orange-yellow gem that's brightening weekly. From now until its next rendezvous with the moon in mid-January, Mars will flame up, nearly doubling in brightness from its current magnitude of +0.5 (which rivals the ruddy star Betelgeuse in Orion) to a dazzling -0.1 (equaling the similarly hued star Arcturus in Bootes). This brightening results from the planet's rapidly decreasing distance from Earth, from 1.174 to 0.926 times the span from the Earth to the sun (109 million to 86 million miles). Each day, Mars moves, on average, about 852,000 miles closer to us. The Martian polar cap should be fully emerged from its winter cloud cover by mid-January, and likely will be a prominent bright spot on the disk's northern limb. Although Mars is moving Earthward in December, you'll still need a steady atmosphere at dawn and at least a medium-size telescope to glimpse any surface features on the little ocher globe. But don't be pessimistic. The Martian disk will grow 21 percent larger during the next four weeks and the polar cap should be fully emerged from its winter cloud cover by mid-January, likely providing a prominent bright spot on the disk's northern limb. Bottom line: It will soon be time to start turning telescopes toward the Red Planet! Mars will arrive at opposition to the sun on March 3 and will be closest to Earth two days later. In the meantime, enjoy its rather wide encounter with the moon late tonight.